Independent living is everything we all hope for in later life. We want to help you achieve this by ensuring that every support we can provide, will give you reassurance and peace of mind for your retirement years. Spacious apartments can accommodate your mobility needs, and can even be adapted for your individual requirements. Your home needs to work around you and not restrict your enjoyment of life. We aim to help you get the best out of life and give you the attention you need. Sometimes when we get older, it’s nice to have a bit of support to live life to the full. We offer tailored care and support packages built around your needs, whether this is domestic support or personal care, these can be funded privately or through County Council funding if you are eligible. It’s a personal service where you get to know your team and you can rely on us to help if you need it now, or in the future. Berrington Court is an extra care scheme, meaning on-site care is available 24/7. 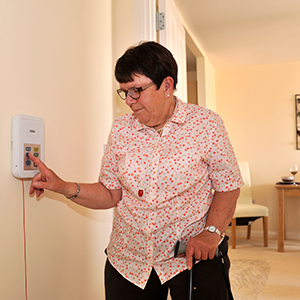 We offer telecare technology throughout the building, discrete 24 hour integrated call systems, providing safety and security around the complex. Knowing these are here lets you get on with life with the assurance that help is always available just when you need it.